There is high-speed Internet access available in these North Myrtle Beach vacation rentals, which interests a great number of guests to Crescent Towers I. Bring your laptop computer and get online with ease during your North Myrtle Beach vacation at this North Myrtle Beach resort. In addition to playing games, sharing photos and sending emails you can look at North Myrtle Beach restaurant menus, golf courses’ tee times and hours of operation for North Myrtle Beach attractions. These two-bedroom North Myrtle Beach condo rentals also feature two baths for your convenience. These condos in North Myrtle Beach, SC with two bedrooms sleep six people and having two baths available is terrific when there are six people in your North Myrtle Beach rental. 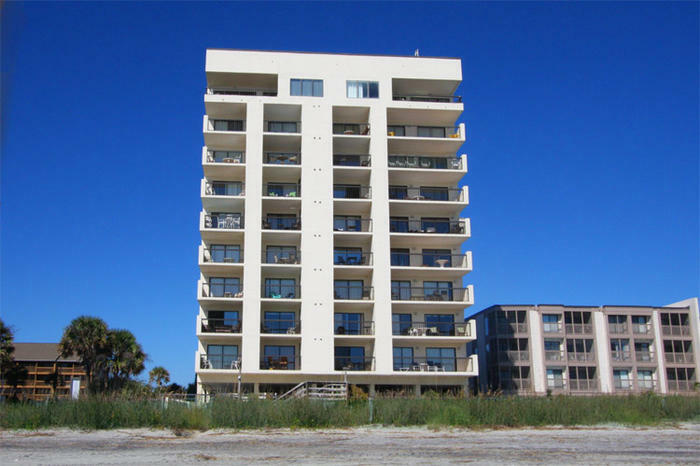 From just about anywhere in these private North Myrtle Beach condominiums you can see through the oceanfront balcony to the Atlantic Ocean and white sandy beaches. The oceanfront balcony in each of these North Myrtle Beach vacation rentals is furnished so you can totally relax. Access to these oceanfront balconies is through the comfortable living room and the private master bedroom at Crescent Towers I. North Myrtle Beach, South Carolina is brimming with fun activities and terrific amusements. There is everything from championship golf courses to live entertainment theatres around town. Everything is just minutes away from Crescent Towers I so you can run around for part of the day and see Barefoot Landing, play 18 holes of Myrtle Beach golf and visit shopping centers nearby without having to spend much time at all in your car. Crescent Towers I is closely located to beach clubs where live beach music beckons seasoned shag dancers out to the wooden dance floors. If you don’t know how to shag dance, then stick around for some complimentary dance lessons. North Myrtle Beach, SC is the birthplace of the shag dance and twice every year there are shag dance festivals where folks come from all over the country to hit the dance floors. The shag is the South Carolina State dance so it only makes sense that when you spend a beach vacation in North Myrtle Beach, SC that your whole family learns how to do these smooth moves. Down the beach from Crescent Towers I is the Cherry Grove Fishing Pier. This family-friendly destination is a treat for all ages as just seeing the North Myrtle Beach skyline from the far end of the pier is worth taking a photograph. From this fishing pier record catches have been made and seeing fishermen reel in their own catches might entice you to pick up a rod and reel yourself. Come to North Myrtle Beach, SC for the food in addition to the beaches because the seafood here is fantastic. Oyster roasts span the winter and shrimp is always on the menu at restaurants around town. Check out Restaurant Row in North Myrtle Beach, SC which is down Highway 17 from Crescent Towers I and pick out a seafood buffet that looks inviting to your family. After dinner, head towards the live entertainment theatres for family-friendly productions that include a talented array of singing and dancing. Carolina Opry, Pirates Voyage, Alabama Theatre and Palace Theatre are all in close proximity to Crescent Towers I.